Seoul, South Korea -- She's not one to count how many hours she spends re-creating Goryeo Buddhist paintings, because for her, it is a way of practicing Zen. << Ven. Hyedam works on a Buddhist painting in this file photo. Also the leader of the KyeTae Temple in Sokcho, Gangwon Province, Ven. Hyedam specializes in producing Buddhist paintings from the Goryeo Kingdom (918-1392). But Ven. Hyedam, 63, who, for more than four decades, usually spends 16 to 18 hours a day on such paintings, thinks it comes down to some 200,000 hours. "There were times when I felt my arm became disjointed, my eyes ruptured and my heart stopped," said Ven. Hyedam in an interview with The Korea Times at an office in southern Seoul. Since she was a child, Ven. Hyedam has been enraptured by Goryeo Kingdom (918-1392) Buddhist paintings. She will show her work based on the paintings at her special exhibition at the Louvre Museum in Paris, France, which will run from Dec. 9 through Dec. 15. "Every nation has its own cultural heritage, which is a tale of the history, spirit and integrity of its people," said Ven. Hyedam. "But Goryeo was the first nation to adopt Buddhism as a state religion. The world at that time was turbulent with internal strife and invasions, and Goryeo's ruling class wished to ask for forgiveness for knowingly harming other people, through Buddhist paintings," the Buddhist nun monk said. The Buddhist paintings created during the period are called Goryeo Bulwha. The chief monk of the KyeTae Temple in Sokcho, Gangwon Province, however, refers to them as Goryeo Hwabul, just as a "wooden Buddha" is called a "Mok Bul." Her efforts are "small" she said, but a meaningful one that aims to reproduce the Goryeo-era paintings in their original spirit, that is, their spirit at the time when Buddhism was crystallized as art. "Every nation has the right to preserve its heritage and should never forget any part of its heritage that was stolen," she said. Unfortunately, however, about 90 percent of the Goryeo Buddhist paintings are now in overseas museums or owned by private collectors. The large majority are in Japan. Among the 10 percent that remain in the nation are ones done in caves and on mountains. The rarity and value of the Goryeo Buddhist paintings make it highly unlikely that paintings now overseas will be returned to the country. For this reason, Ven. Hyedam has been re-creating them based on historical records. Ven. Hyedam said the works that she will exhibit at the Louvre include, most notably, the "Water, Moon Gwaneum" of the Bodhisattva known for compassion. The painting is also known as the "Water, Moon Avalokitesvara." "The ‘Water, Moon Gwaneum Sang' paintings represent mercy, the idea that everything, every sin, is forgiven," she said. Usually, the "Water, Moon Gwaneum" paintings start at two meters high. Her largest painting of this type measures five meters high and took three years to complete. It is on display at the KyeTae Temple in Sokcho, Gangwon Province. "I hope that people will know that these Buddhist paintings contain the Korean culture and spirit," she said. "This idea should shine like a thoroughly cleansed mirror," she added. When she started drawing, impressively before primary school, she didn't quite yet grasp the significance of the Goryeo Buddhist paintings. She only did so starting 28 years ago. Throughout her life's journey, she believes that the Goryeo Buddhist paintings should be a reminder for the Korean people, who in the fast-paced and busy 21st century, live in forgetfulness. Ven. Hyedam's "Water, Moon Gwaneum" paintings look exotic, having been completed using a technique that originated from India and then traveled through China before coming to Korea. She works with bold primary stone pigment colors on silk, first painting from the back so that the colors could permeate to the front and then work on the front in a "back painting" method. Before she paints the colors, she repeatedly applies the glue on silk so that the stone pigment will stick to the silk. Afterwards, she applies the gold pigments with a fine brush that gives the Goryeo Buddhist paintings their incomparable finesse and adroitness. "What's distinct about the ‘Water, Moon Gwaneum' paintings is that they are simple and elegant," she said, unlike the Chinese paintings, which are more dynamic. There are also Rinceau patterns throughout the painting, which is distinctive in Goryeo Buddhist paintings. In the paintings, the "Gwaneum" is situated near a small pool of water and willow trees, with the young Sudhana who came for enlightenment at the feet. Although she used bold colors, she also used gold for the outer fine lines, which give the paintings elegance, Ven. Hyedam said. While she now devotes only 10 hours a day to these paintings, Ven. Hyedam is still is hard at work. During the past 63 years, she said she has produced about 300 works. She now has about 70 left in her possession. When she holds the brush, especially for large-scale works, Ven. Hyedam confessed that she doesn't paint on her own; rather a bigger force guides her hand to create certain structures, designs and colors. "You can say I am enraptured when I draw," she said. 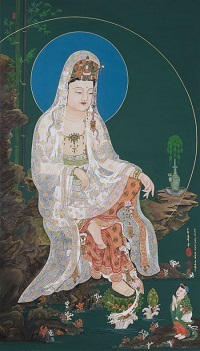 In a forward she wrote for the program for her sixth exhibition held at the Sejong Center for the Performing Arts in Seoul in August 2007, she said she devoted herself to the Goryeo Buddha paintings after the honor of seeing the Buddhist Goddess of Mercy in the sunrise during a Zen-Buddhist meditation. When she was working on the painting "500 Ahran," she almost gave up, but twice, she had a dream that prodded her to continue to draw more perfectly, she said. When asked if she is happy to be working on something that she can totally commit to, "I think I made a sacrifice. But I am so happy beyond words when I finish a work, so much so that I jump up and down," she said. Several years ago, she said she felt sorry to the professional painters of the Goryeo era for her lack of finesse, but now she said she feels that she does justice for them. She explained that she felt that she was a battlefield commander who had killed people in a previous life, for which she atones by re-creating the Goryeo Buddhist paintings. She considers herself as a Goryeo Buddhist painting as well, an idea based on "a sole resting place for the people, especially those who are worn out," she said. Ven. Hyedam can be reached at hanja5187@naver.com.